I recently joined a group of fellow food bloggers called Foodie Friends Friday. It is a great way to meet new bloggers and find some amazing new recipes to share with you! I am really excited to be a part of this wonderful group of fellow foodies! I came across this great blog - Chef PickyKid and Me. She is a mother with a daughter who loves to cook. Like me, she encourages her daughter to participate in the cooking process in order to get her excited about trying new foods. She focuses on simple recipes using commonly found ingredients. What could be better? I have been dealing with a houseful of people hit with a bad cold, so one post really caught my eye this week. 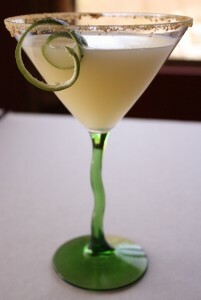 Her amazing Key Lime Pie Martini! Ok, so it isn't a "meal" per se, but how delicious and beautiful does this look? Let's face it, we moms have a really hard job, and isn't it nice to unwind after a long day with a decadent cocktail? Why bother going to a restaurant when you are covered in kid snot and utterly exhausted? Just mix yourself this stunner! Check out her blog for other cocktails from this former bartender (isn't she great?!) as well as her other wonderful food recipes! Summer is in the air and summer produce is really starting to become available! When I saw fresh cucumbers at the farm, I knew I just had to make my Greek salad. It is such a great side dish on a hot day! It works so well with a number of main dishes ranging from pastas to burgers to BBQ. This salad is just bursting with colors and textures! I actually just starting growing my own cucumbers, so I can't wait until they mature and I can make this salad with cucumbers from my own garden. And of course, it is even better with fresh, local tomatoes. This salad is kid-friendly with a mild flavor and small, bite-sized pieces. My daughter loves to help put all the veggies in the bowl after I cut them up. It is another recipe that can be made early in the day in order to make evening dinner prep that much easier. And who doesn't love that? Assemble the chopped ingredients into a large bowl. Stir to combine. Add the dressing and lemon juice. Toss to coat evenly. Let chill for an hour before serving.